The state’s largest school district just got its final grades back. 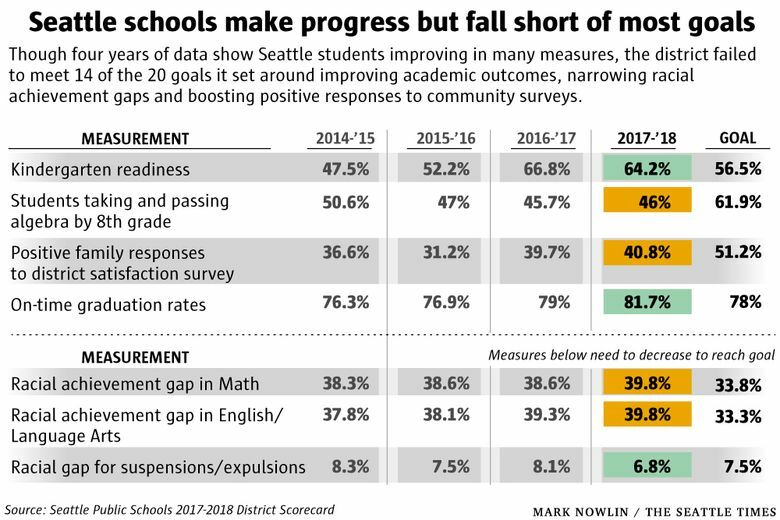 By Seattle Public Schools’ own standards, the results aren’t improving fast enough. According to the district’s latest scorecard, released this past week, the district missed 14 of the 20 numerical goals it set for the 2017-2018 school year, which included narrowing the ever-widening gap between students of color and their white peers, more positive responses from families and students on district surveys and improvement on state exams. “On my desk right now, I keep a printout of a slide that shows African-American [students’] achievement in third grade. And the fact that the proficiency is at 36 percent in literacy … it’s just a reminder,” said Denise Juneau, who has worked as Seattle Public Schools superintendent since this summer. The scorecard, released every November, serves as a public progress report for student-performance data, discipline rates, graduation rates and other outcomes. This year’s scorecard is the fifth and final assessment of the district’s implementation of the 2013-2018 strategic plan. The five-year goals developed for the score cards are meant to strike a balance between aspiration and reality, said Eric Anderson, the district’s director of research and evaluation. Compared with 2013, Anderson said, the district achieved more of its targets this time around. “That is not, in any way, to imply that we are [fully] satisfied,” he added. There were some promising trends. On some measurements, such as reducing discipline practices that disproportionately punish students of color, the district met its improvement target — though a gap still exists. But for other goals, the data show the district has a long way to go. The percentage of students taking and passing algebra exams by eighth grade, a sign of accelerated math achievement, declined from just over half to 46 percent since the 2014-2015 school year. This year’s figure of 46 percent fell almost 16 percentage points short of the district’s mark. Anderson said the decline is likely related to tougher state math exams introduced during the same time period. Schools that saw lower scores may have referred fewer students to take algebra. And though the district’s performance on those tests has improved, the positive numbers could partially stem from a growing population of wealthy students entering the district. Over the past four years, racial achievement gaps in math and English also widened slightly. The district measures the gaps by calculating the difference between average proficiency on state exams for White/Asian students and Black, Hispanic/Latino, Native American and Pacific Islander students. The gaps between the two groups of students are about 40 percentage points wide. So far, Juneau has focused on a “listening tour” to gauge what’s right and wrong in the district — she hasn’t yet announced a strategic plan of her own. In light of the scorecard, she said that narrowing the achievement gap will require sustained and aggressive work on improving school environments for students of color and their families — more robust family engagement, teacher diversity and culturally responsive curricula. There were similar mixed results for Native students. Graduation rates and college-level-course completion increased over the past four years, but their rate of discipline, 13 percent last year, is still higher than any other racial demographic.